This is not a mountain, it' s the valley that divides Lepontine alps from Retiche alps, so, as for actual geographic division of Alps, the border between Western and Eastern Alps. Its correct name is Val San Giacomo but all call it "Vallespluga". You can amuse in all seasons : all mountains here are normally quite easy to be climbed (normally F or PD) but belong to a wonderful environment and can teach something about mountaneering. I think it is one of the best areas for making first mountain experiences. 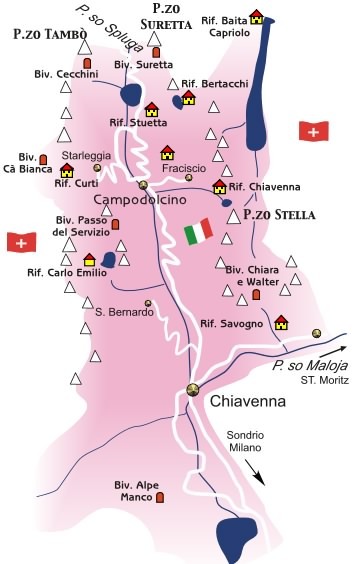 The main range of the valley, between the Val Curciusa to the West, the Rhein valley to the North, the Passo Spluga (2113m) to the East and Passo del Baldiscio (2301m) to the South. from the East ridge of Pizzo Quadro a long ridge (Servizio) with the Pizzo Truzzo (2723m) and the Corna della Camoscera. 5 hours for Tambò, Ferrè and Suretta ecc. Few marked paths, hikers can amuse finding here many fine ways to spend time with the only use of a map. Val d'Oro - Soste - Stuetta (1865m) along the "sentiero del Cardinello"
Madesimo - (1538m) along the "muretto degli Andossi"
near Cimaganda (on the road that brings from Chiavenna to Campodolcino) a lot of boulders in perfect gneiss allows to amuse.